Reference number for this case: 12-Jan-54-Binges. Thank you for including this reference number in any correspondence with me regarding this case. According to a 1982 catalog of ufology group ADRUP, the regional newspaper Le Bien Public, of Dijon, for January 14, 1954, reported that on January 12, 1954, on the territory of the commune of Binges, residents found a sounding balloon of the US Army. It was made of a large red parachute supporting precision instruments. All had been deposited at the gendarmerie of Pontailler. The newspaper wondered if this could be the craft that had been seen in various parts of this region and that "some thought it was fit to name a bit hastily a 'flying saucer'." Tuesday morning, on the territory of the commune of Binges, inhabitants found a sounding balloon of the American army. This craft was made of a large red parachute supporting precision instruments. The whole thing was deposited at the gendarmerie of Pontailler. It could be the craft that was seen in various parts of this region. And some thought it necessary to baptize a bit hastily "flying saucer". I am delighted that the ufology group ADRUP has noted this case while so many ufologists are ignoring cases with a prosaic explanation. What was found was not exactly a "sounding balloon", but only the radiosonde of a weather balloon with its parachute. The balloon exploded at high altitude, as it happens in principle, and the parachute allows the recovery of the instruments undamaged. 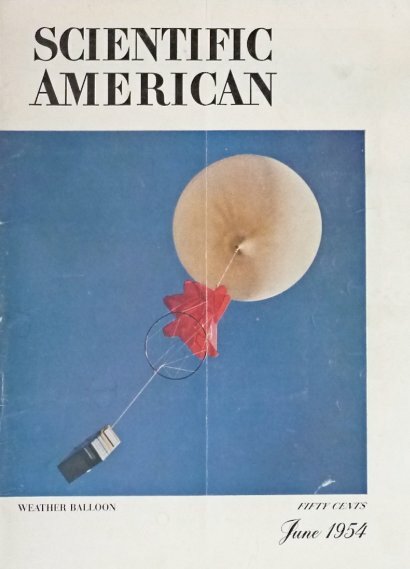 Above: on the cover of Scientific American magazine of June 1954, a U.S. Army weather balloon. Under the balloon, the red parachute, under the parachute, the radiosonde. When the balloon goes up, it expands. At very high altitude, it explodes, and the radiosonde descends while being braked by the parachute. 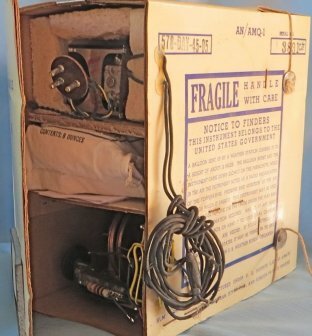 Below: 1950s American radiosondes. The box is usually marked with "United States Government" and instructions for the discoverer to return the device to the authorities. On the other hand, it was speculated by the newspaper that the device may have been mistaken for the "flying saucer" reported in the region. This is not absurd a priori, but it turns out that what was widely seen on January 9, 1954, and widely reported in the press was a meteor. [---] Article in the regional newspaper Le Bien Public, Dijon, France, January 14, 1954. [vi1] "Catalogue, in the ufology bulletin Vimana 21, A.D.R.U.P., ufology group, France, #0-11, page 9, 3rd quarter 1982.